Our chef Victoria LOVES quesadillas. Why? Because they are D-E-L-I-C-I-O-U-S with a capital D. They also remind her of the time when she hopped off to Mexico for a few months with a couple of Mexican Pesos in her pocket and not much else. She would often eat quesadillas twice a day for weeks on end, and never tire of them! We’re hoping you enjoy these tasty Mexican beauties as much as her - provecho! Peel the red onion, cut in half through the root and finely chop. Peel and finely chop the garlic (or use a garlic press if you have one!). Separate the coriander leaves from the stalks, roughly chop both and keep separately for later. Using a large sharp knife remove the corn kernels (see photo). Grate the cheddar cheese. Heat a splash of olive oil in a large frying pan on medium heat. Add three quarters of your red onion and cook over medium heat for 4 mins until soft. Add the garlic and coriander stalks and cook for another minute. Now add the Mexican spice and smoked paprika and cook for a further minute. Taste and season with salt and a good grind of pepper, then remove from the heat and transfer your mixture to a large mixing bowl. Wipe your frying pan with a kitchen towel. Drain and rinse the black beans and add to your large mixing bowl. Roughly mash everything together. Stir in your corn kernels, cheese and half your coriander leaves. Taste to check the seasoning and add more salt and pepper if needed. To make the quesadillas, lay out the corn tortillas and share your mixture evenly between them, spreading it on half of your tortilla only. Fold over each tortilla to make semicircles and set-aside whilst you get on with the salsa and the citrus sour cream! For the crunchy tomato salsa, finely chop the tomato and baby gem, then combine with your remaining red onion and coriander leaves in a small bowl. Zest and juice the lime. Add half your lime juice, a good glug of olive oil (don’t be shy!) and season well with salt and pepper. For the citrus sour cream, mix together the sour cream with your remaining lime juice and season with salt and pepper. Taste and add some lime zest to your liking. 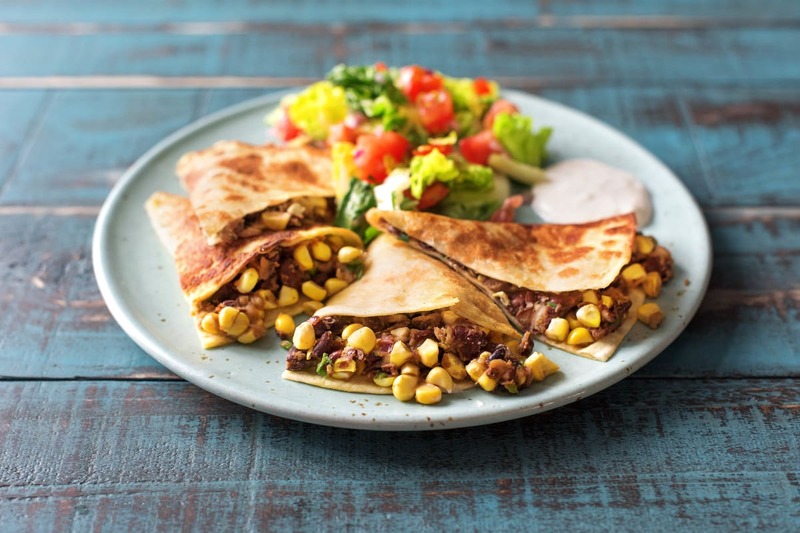 Heat your large frying pan with a splash of olive oil and fry each quesadilla until golden-brown on each side. Tip: If you have a big enough pan, fry two at once to save some time! Carefully cut your quesadillas into wedges and serve with your crunchy tomato salsa and citrus sour cream on the side. Enjoy!